OBH even had Nyel’s dinner waiting! Dorothy had it SO right! There is no place like home!! When we finally rolled into the Ocean Beach Hospital in Ilwaco about 6:30 last night, Nyel had been “pre-admitted” (he only had to sign the paperwork) and they had kept his dinner warm for him! Not that he had much appetite. That’s been one of the sure signs that he is not a well man. In thirty-five years, I’ve never known Nyel to willingly skip a meal but he’s passed on a number of them in the last few weeks. He confided to me last night that he absolutely wasn’t hungry but he made a valiant try at eating out of sheer gratefulness. He was, at last, on home territory! People were greeting him by name! Care by people who know him and truly want the best for HIM, What a concept! The dinner menu was tilapia and Brussel sprouts – both of which Nyel really likes under ordinary circumstances. 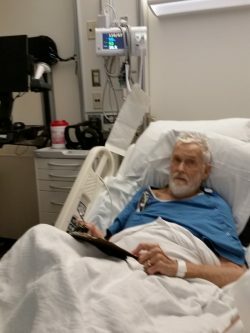 He took a few bites, but he is still “up to here” in the feeling-full department – a direct result of his congestive heart failure. He looks forward to improvement soon. After all, food is one of the few pleasures open to him at the present time. Plus, he knows he’ll have some hard work ahead in the physical therapy department and he’ll need nourishment and energy to help him through! It wouldn’t have mattered a twit except that Ocean Beach Hospital had asked that he arrive before the shift-change at 7:00. We made it… but not by much. I wouldn’t even be mentioning this last frustration except that it seemed the final irony. Even getting Nyel discharged was difficult. Well, never mind! Onward and Upward! I can’t wait to tell the chickens that Farmer Nyel is almost back home! Yesterday Nyel was (apparently) privileged to be part of the ‘Providence St. Vincent Medical Center Department of Nursing Monthly Skin Evaluation’. According to the handout that was supplied by the “Skinny Nurse” (as they call the designated skin-check-nurse on this floor): As a part of our nursing department’s ongoing quality improvement efforts we evaluate all inpatients on a given day once per month for any skin problems. This is over and above the assessment your assigned nurses do each day. What Nyel and I understand from that is that if you are “lucky” enough to be in the hospital on the particular day of the month that is the designated “Skin Day,” you get an extra examination. We are not sure how this helps the many patients who are in the hospital only on the other 29 or 30 days of the month. 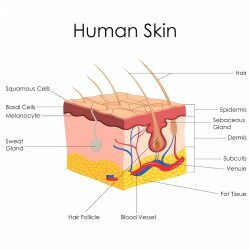 If this skin check routine is part of some “study” or for the benefit of the staff, it might make more sense. As it was presented, though, Nyel and anyone else who happened to be “in residence” on Tuesday, March 12, 2019, get a bit of extra attention – part of an ongoing improvement effort but only for some??? Hmmm. 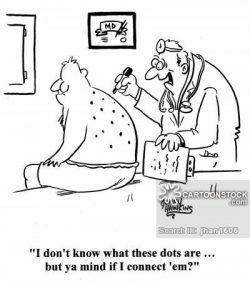 The information sheet goes on to say: The evaluation is done by nurses who are experts in skin care issues and requires that they look at all your skin surfaces. It will only take them a couple of minutes to do this… They will come in pairs and identify themselves to you…. The “pair” turned out to be a single person who has been Nyel’s day nurse several times during recent rotations — a nurse we like very much. Yesterday he was wearing his specially trained “Skinny Nurse” hat. No one was with him. Still and all… it’s nice to think that Nyel is among the few who are benefitting by this bit of extra attention. Yay! It’s a familiar dance step – one that goes with a variety of tunes. Curiously, it doesn’t have a name – at least not one I can find among the 37 dances listed in the Oxford English Dictionary. 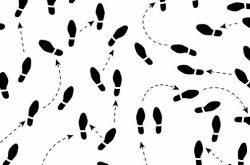 Not one dance from #1 “Pop Goes The Weasel” and #2 “The Virginia Reel” to #36 “The Rumba” and #37 “The Shimmy” — not one is based on that familiar pattern of one step forward and two steps back. But, even so, it is the step-pattern of choice here at St. Vincent’s Hospital. There are a few variations, of course. Sometimes there are three or even four steps back and, sometimes no step forward at all. It’s all very confusing to the willing learners such as Nyel and myself. And, the confusion is often compounded by the dance instructors (read doctors), themselves. Not only do they disagree with one another, they often (apparently) disagree with themselves. Take yesterday, for example. A dance instructor (read doctor) from another dance team (read medical discipline) came in for a consultation. His suggestions for a change in the dance pattern sounded terrific. It seemed that his plan would soon have Nyel moving two or three steps forward without backward movements or even dips. But, somehow, there was a change in his thinking after he left here and his original plan was scrapped. Nyel’s dance routine was suddenly in a reversionary mode – steps that were tried days ago, and were found ineffective then, have been put back in his routine. We’ve requested a conference with both dance instructors together. Although both have agreed, they have come in separately. That has happened twice this morning – they apparently don’t understand the terms “conference” and “together.” One comes and justifies one thing. The other comes in and justifies something else. Perhaps they are still trying to coordinate. The only thing that seems consistent is that Nyel will not be leaving this dance studio for the foreseeable future. Probably not for another week. Through the magic of cyberspace, Nyel is in communication with his Number One Danseur in Seattle who has offered to consult with these St. Vincent’s’ hoofers if they initiate the request. Neither Nyel nor I believe that they will consider doing that. Stay tuned… if you can find the appropriate melody. This morning begins Nyel’s eighth full day as a patient at Providence St. Vincent’s Hospital in Portland. 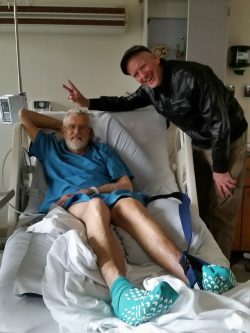 When he arrived in the wee hours of March 1st, the focus (of course) was his broken hip. That has been repaired and all protocols have been put in place for his healing and eventual recovery. 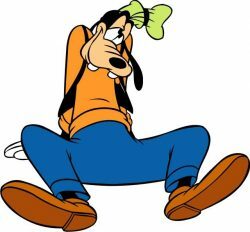 Once the hip was repaired, his orthopedic team was alerted by his Number One Advocate (that would be me) that perhaps a bigger issue might be his long-term congestive heart failure. Eventually, a staff cardiologist was consulted and has weighed in on matters such as diuretics and blood thinners and other medications. Yesterday there were some dramatic changes. 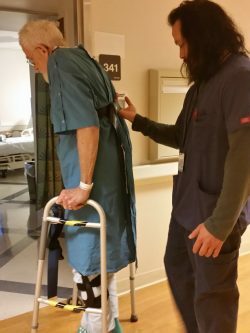 All in all, Nyel’s care seems more inclusive and we are seeing some positive progress. His work with the therapists – occupational and physical – has picked up after skipping that day of deep sleep and interesting visions. Yay! Back on track. The Homeward Track we hope. Yesterday, with very little fanfare, Nyel mounted his Knee Scooter and headed east. Through the south garden, over our scraggly winter lawn and down to the chicken coop. 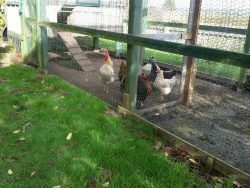 The girls and boys, ever attuned to goings-on beyond the coop, gathered at the hog-wire fencing and watched his approach. They were quiet – perhaps awe struck – as they tried to figure out what was coming their way. I thought briefly of the rabbits in Watership Down and their fear of motor vehicles which they called hrududil (plural for hrududu.) 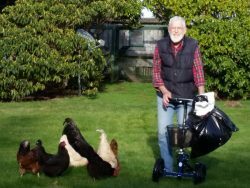 I wondered what chickens would call a knee scooter and if they even recognized that it was Farmer Nyel who was propelling it. As always, it’s hard to tell with chickens. It was even hard to tell with Farmer Nyel – I don’t know if he was expecting a little more fluff and flurry after his three-and-a-half-month absence. Perhaps of greater importance to the flock was their release from confinement. As soon as I was safely back in the house and out of harm’s way from that killer rooster, Farmer Nyel opened the gate and let them into the yard – also a first in three-and-a-half months. He reports that they were initially a bit tentative but, with the enticement of some scratch, they were soon off and pecking – Backyard Chickens once more, ‘just as God intended” as our friend Ti would say. Nyel spent an hour or more doing his Farmer due diligence – cleaning the coop, putting fresh cedar shavings on the floor and in the nest boxes and, generally checking things out. As requested, he called from his cell phone when he was ready to head back to the house. I wanted a picture of Farmer and Flock and was willing to brave a confrontation with you-know-who to document this big red-letter day. But, no worries. When Farmer Nyel paused in his homeward trek, all seven chickens gathered round for the offered treats with ‘nary a glance at me. The little red hen even ate from his hand just as she had done in the past. Who knew there was enough memory space in that teeny-tiny brain to remember that trick! Nyel didn’t let on but I’m pretty sure he was pleased. As for the chickens… I’d wager they were, too. “It ain’t like it used to be” is almost a mantra in our household these days – a sure sign that we’ve grown long in the tooth and, probably, not gracefully. This morning it had to do with Nyel’s current foot and shoe problems. Although he has his surgeon’s okay to put weight on his foot, he is finding it impossibly painful to do so. As in so many problems to do with health and lack thereof, the reasons for this are probably multiple, arthritis being the main culprit. 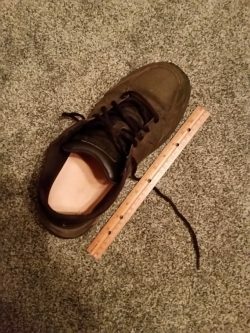 For years now, Nyel has worn custom-made orthotic inserts in his shoes which help alleviate said pain but, currently, his left foot is so swollen that he cannot get his shoe on. The reason for the swelling says his primary care doctor is “a combination of surgery aftermath and his congestive heart failure problems.” Great. Nyel got his first Nordstrom credit card (which they won’t let him use anymore) in 1966 – just three years after the (then) 55-year-old store had begun carrying some items of women’s clothing. 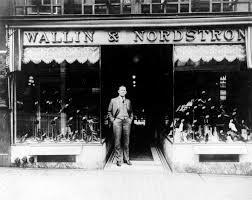 They had started as a shoe store, Wallin and Nordstrom, in 1901 and prided themselves on service. As we “remembered” all that, Noreen came into the conversation. 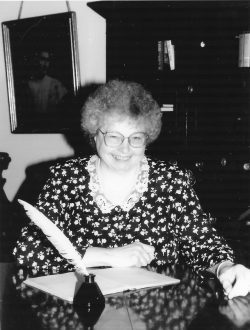 Noreen Robinson had suffered from polio as a child and it left her with disparate sized feet. She once told me that she had always purchased her shoes at Nordstrom – the left shoe and the right shoe each from a different pair. And even though they had to break up two pairs to make the sale, Nordstrom’s only charged her for one pair. Noreen swore by Nordstrom! Today is a Red Letter Day of sorts. Nyel is taking the driver’s seat! Literally! 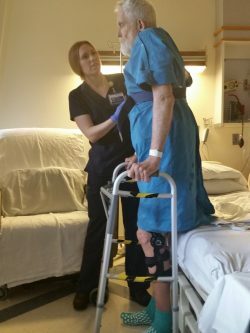 It will be the first time since his Big Fall on October 3rd – the one that resulted in his complicated leg break – even though his surgeon said that he could drive as long as he wasn’t taking opioid pain meds. 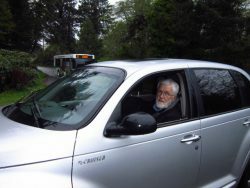 He hasn’t and isn’t and, though I am reluctant to admit it, I’ve been the one that has encouraged him to continue being chauffeured. By me. We both recognize that we are victims of one of those automatic hovering mothering mechanisms that kicks in whenever someone (other than me) in the household becomes impaired. Nyel has learned that it’s easier to take a “whatever…” attitude than to deal with my fussing and, so it is, that I’ve been doing all the driving. Until today. When the EMTs arrive to transfer Nyel into the car, it will be to ease him behind the wheel! He’s more than ready. I am resigned. I see it as one of those necessity things. I have an eye appointment across the river – a biggee to check my glaucoma, dry eye, peripheral vision etc. etc. There will be drops. 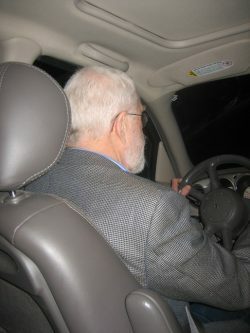 In the past it has been my experience that I do not see well enough to drive safely for twenty-four hours or so after such an appointment. So… today is the day that Nyel re-enters the mainstream, so to speak. I console myself that, after all, it’s his left leg that isn’t operable, plus we have an automatic transmission and cruise control. No problem, right? And besides all of the above, today marks the “less than a month to go” before his next appointment with his surgeon and, presumably, his release from this “non-weight-bearing on the left leg” sentence. January 9th will be the next Red Letter Day! Woot! Woot! Does Nyel need any help? The phone rang mid-afternoonish. “I just read your blog. Does Nyel need any help putting that KneeRover together?” asked Tucker. “I’m not sure. Why don’t you come over and find out?” was my response. I was in my studio, hard at it, and went right back to work. 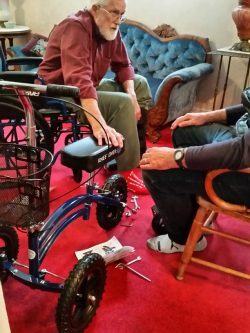 It was probably an hour before I thought to go see what was happening in the rest of the house and when I did, there they were – Nyel and Tucker and the all-but-assembled skooter. 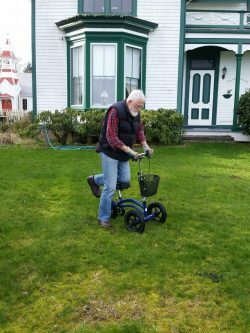 I watched as Tucker attached the “training wheel” onto the left side of the rear wheel. “For extra stability,” they told me. “Do you have a tire pump?” Tucker asked as he checked the other three wheels. The answer was “No” although I seem to remember that we do. Somewhere. No problem. Tucker went home and got his. It even has a pressure gauge which I’m pretty sure ours doesn’t. Soon, each tire registered forty pounds as directed in the instruction manual and Tucker was off to the dining room on a test run. His report: difficult on the carpet and doesn’t turn on a dime. Not even a quarter. Nyel was next. 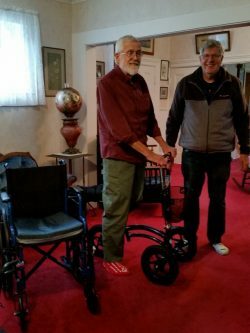 Tucker and I hovered (no doubt uselessly) as the patient transferred himself from wheelchair to skooter more-or-less effortlessly, it seemed to me. There was some experimenting with the height of the handlebars and… he was off! It didn’t look easy and it didn’t look exactly fun. Not on the carpet, anyway. I didn’t have any dinner last night but I certainly didn’t go to bed hungry. 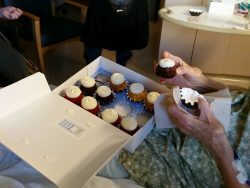 Bill and Sue had come visiting in the afternoon and brought a box of a dozen little frosted cupcakes – all beautiful, delicious, and totally decadent! – and I had eaten two of them. 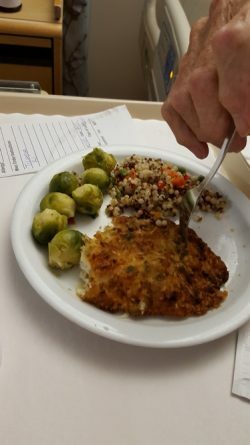 Not enough to stave off the desire for a decent dinner but, the operable word here is … well, suffice it to say that it’s hospital food and I long ago ran out of options. The thing is… over the last year (since Oct. 4, 2016) we have been here at Emanuel Hospital for 66 days, mostly in increments of 5 or 6 days at a time. That’s more-or-less 132 lunches and dinners. On the “Guest Menu” there are four choices for those meals. Not four for lunch and another four for dinner. 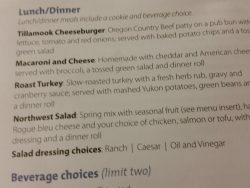 The same four choices for both meals: 1) Tillamook Cheeseburger; 2) Macaroni and Cheese; 3) Roast Turkey; 4) Northwest Salad. Lunches and Dinners cost $10 each, cash on delivery. It seemed reasonable enough at first. Now… not so much. The meals are ‘passing fair’ as my mother would say of things that were barely okay. But, even if I liked them all equally and alternated them evenly, that’s about as much hospital food (baked hamburger patty? Soupy mac ‘n cheese? One veggie choice – broccoli?) as I can stomach. So… no dinner last night. 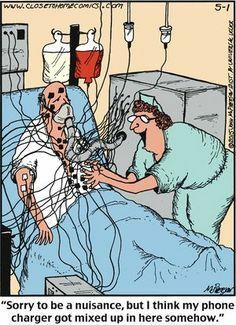 I hasten to say that the Patient Menu is entirely different, thankfully. Nyel has sixteen lunch and dinner choices as well as a “build your own sandwich’ option with multiple possibilities. Granted, it’s a heart healthy menu which means only, as far as we can tell, no salt. Otherwise, it looks great and Nyel is quite happy with his meals. The problem for me, of course, is that guests are not allowed to order from the patient menu. Even if they pay. The Kitchen Nazis won’t allow it. Maddening. There are options. There are two cafes on the first floor. One is a serve-yourself sort of buffet, on open for limited hours only. I have checked it out and put the entire place in my mental round file. Dreadful! The other possibility is the Heartbeat Café. Again, limited choices (and hardly gourmet) but when I really am wanting a Caesar salad (and have a momentary lapse, forgetting that it will be just a pile of wilted lettuce with some shredded bits of parmesan cheese) I do venture forth. I could, of course, take the car and go ‘out’ for a meal now and then but it just doesn’t seem worth the effort. Plus, I’m not a huge fan of eating alone in a strange restaurant. And, it’s not that friends (bless them!) haven’t offered to come whisk me away for a meal. But, that seems way too much ‘all about me’ when the whole reason for being here is to support my honey. However, there is one option left which I’m thinking of exercising today. Calling for take-out service! 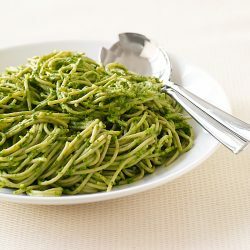 I have a hankerin’ for a big serving of pasta with pesto sauce and an order of garlic bread. And maybe a tossed green salad (hold the lettuce??). I Googled ‘takeout food near me’ and found a half-dozen possibilities from an Olive Garden to a pasta bistro that will deliver right to Nyel’s hospital room. Yay for the Big City!